I really like Laura Jarratt as a writer. Her books are heartfelt and thoughtful and her latest offering is no exception. 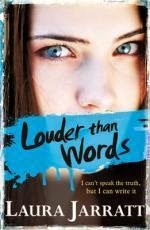 Louder than words is the story of Rafi, a teenage girl who has been mute most of her life. I really enjoyed her story and finding out about more as her as a character. I loved her relationship with her new best friend Josie and loved seeing the unusual way in which it developed. I must admit that this book was a little bit spoiled for me because I think the blurb gives too much away and made me feel like it was dragging because the things I knew about the book were a good way through the book. I which I had read it before looking at anything written about the book as part of its promotion.